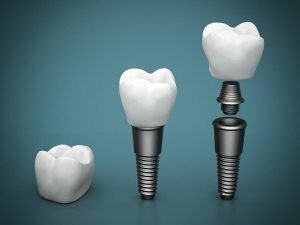 Dental implants are screw-like artificial tooth root replacements and are usually made of titanium. Unlike dentures, dental implants are placed in the jawbone during an operation. The bone grows around the implant. This attachment helps hold the implant in place, making it sturdy. To fill in the gap caused by the missing tooth, an artificial crown is attached to the metal. The crown is positioned to look like the old tooth. Dental implants are also used to hold dental bridges and dentures in place. When does one need a dental implant? Why are dental implants required? Missing teeth cause discomfort in speaking and eating. If the gap is left unfilled, you might end up with misaligned teeth and develop a ‘bad bite’. We don’t want that to happen. Missing teeth can also cause bone loss in the jaw, harming your appearance. DonEast Supreme Dental is here to help you restore the smile that was once lost. We cater to patients from local communities in Templestowe, Balwyn North, Doncaster, Doncaster Heights, Donvale, Mont Albert North, Box Hill, Box Hill North, Kerrimuir, Blackburn North, Forest Hill, Nunawading, and Brentford Square. What are the procedures during dental implantation? Before anything else, an initial consultation with your dentist is conducted. It is followed by X-rays and a discussion of your recommended treatment plan. The dentist will present the suggested procedures and the corresponding costs. The start of the procedure is the instalment of the implants through surgery. A metal screw-like implant is placed in the drilled part of the bone. You will wait for 4-6 months for the implants to be fully integrated into your bone. Your dentist will take impressions and create a model as the basis of a new crown or bridge. The new crown or bridge is then attached to the exposed implant to make it look, feel, and function just like natural tooth/teeth. Dental implants provided by DonEast Supreme Dental are known to be effective and outstanding among dental clinics in Doncaster East area. If you have lost your teeth and would want to restore your teeth’s normal functions with implants, call (03) 9842 1475 or come and visit us at 1062 Doncaster Road in Doncaster East.